Keep you mind clear, your heart open and your body in harmony and everything goes ok! Every day is a new experience. Old roadblocks and fears only stay because they get reenergized. Why not reenergize a new story. Create new experiences by leaving that “E” behind and GO with a new story. Go power often requires just taking you foot off the accelerator so you have time to see the roadblocks before they occur. “If it isn’t fun, you’re doing something wrong!” A quote from the book. If there is pressure within – there will be pressure without. So, making even trivial or mundane jobs fun – we used to wash out the trash cans in our bikinis (in the summer) – helps focus desire to reach every goal without pressure and with enthusiasm! Let’s call it Peace Year and have it last forever. As we share love and understanding and remove judgements, world peace becomes easier with every step. Ever wondered why we clean house, mow the yard or hire someone to do it weekly? Now what about cleaning out our ego regularly. Many books have recently been writen about the power of forgiveness, love (not new), even living in the present. We have written one about regularly cleaning out the ego. Try it! Every Saturday or over the weekend, go through and find out if anything is stuck because of too much pride, wanting to be right, or needing to have it your way. Try cleaning that part out and start the week fresh with a win-win approach. Love to hear how it works for you! Have you ever been really frustrated with the buzzing fly while trying to concentrate or have a meeting or a gathering? It can be embarrassing if it’s your house or office. It’s seems difficult to remove the fly. But it is really very easy. You need to know how a fly flies to be successful at catching the fly. Here’s the secret – a fly lifts off backward, not like an airplane – forward. Now you know the system, you can always catch a fly. We are the same. People tend to do the same actions, emotions, patterns over again. If you desire to “catch” a goal which has been elusive, find out more about the way it works. When you operate the way the system operates, you are successful. If your ego is stubborn, try putting a key to your house in your car and try to start it. We need the right key, the simple information for each goal – how the sytem works. 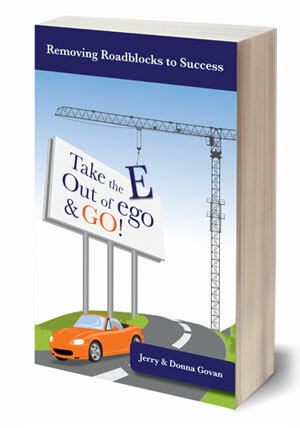 Removing the E out of Ego allows us to be patient and discover the system so we can be successful. Probably the most effective technique I have used as a entrepreneur to accomplish my goals which sometimes pushed other people’s limits has been the preference technique. Instead of saying, “This is what I want you to do” or “This is what I need,” the wording is: “I would prefer that you would do …” or “I would prefer to receive my payment in ___ form, please.” I have found I can maintain my confidence & inspiration and allow the other person their freedom to feel good about helping out. Try it! It works great in personal relationships too! Anyone else tried it? E Out of Ego Daily Insight – Release to get high! We have been removing the E in a unique and effective way: release internal pressures. Roadblocks are so often only in our own mind – our perception. Letting go of “I can’t” and allowing the idea of “I can” is often as powerful as the crane removing the obstacle to your success. As Buddha put it: Success is not the way to happiness. Happiness is the way to success. A healthy ego is sensitive. A sensitivity to people and the feelings we are picking up around and from within us is necessary for a healthy ego. Can you remember when you felt there was something coming between you and a friend or person in a conversation? Sometimes it is too much Ego and sometimes not enough (they want to hear about you!) . It’s like walking in their shoes and your own at the same time. We are all sensitive. We just need to recognize it. Some people, mostly mothers and fathers are really happy about school starting again – for the kids. But what about the fact that we are all back to school every morning. Is there a day you can remember that you have not had to learn something new? I can tell you that since writing this book, and getting it published and now marketing it, I have been learning more than the kids in school for sure! Learning blogging, social networking, new business contact managers – you name it. The kids want to finish school and get out, we want to learn faster what they already know! So, it really helps to keep our ego out of the way, so we can learn fast, so as the world changes we are in the flow! No roadblocks here!. We have found that sensitivity has more to do with how we act and respond to another person’s ego than we might think. For instance, if someone challenges you, you may automatically respond to meet the challenge. If someone comes on with a puffed up Ego, we may tend to puff up and tell our story. With sensitivity, we can tune into the intent BEHIND a comment and DECIDE our response. For instance if the comment seems to be self-serving, we can choose to give the preson some supportive credit instead of trumping up a comment about ourselves. Sensitivity tends to inspire maturity. What do you think?